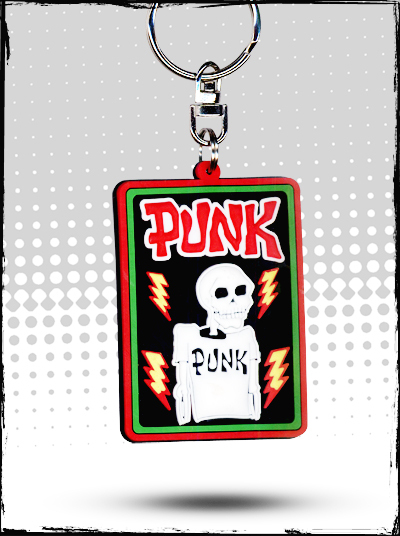 PUNK Keychains :: Official keychains featuring six designs by founding editor John Holmstrom. 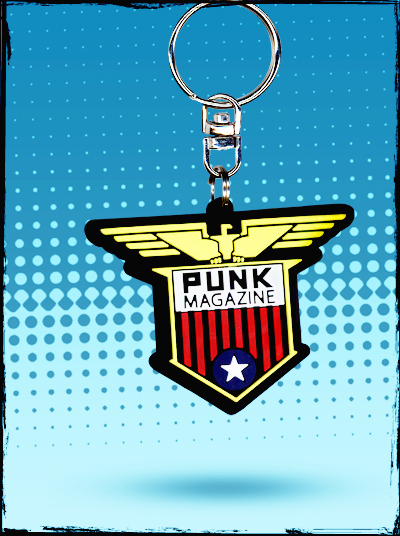 PUNK Magazine Logo Keychain, The classic PUNK magazine logo in a bold outline. Made of sturdy rubber, 1/8" thick. The logo is raised, giving it a 3-D effect. The keychain loop is metal. Imported from Japan and manufactured by Morrison & Co., Ltd., PUNK magazine's licensing agents in Asia. 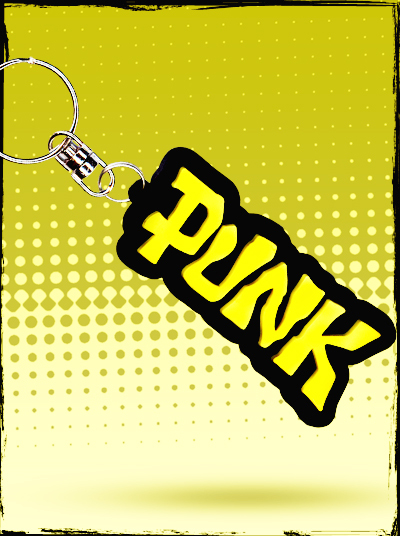 PUNK Magazine Logo Keychain in yellow, The classic PUNK magazine logo in a bold outline. Made of sturdy rubber, 1/8" thick. The logo is raised, giving it a 3-D effect. The keychain loop is metal. Imported from Japan and manufactured by Morrison & Co., Ltd., PUNK magazine's licensing agents in Asia. Watch Out! 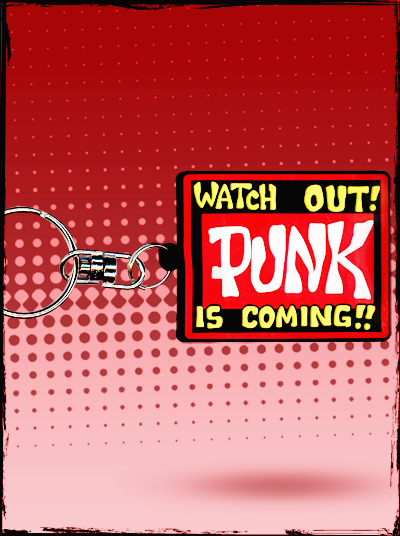 PUNK Is Coming! Keychain! The famous poster that announced PUNK magazine to the world! In a great four-color treatment. Made of sturdy rubber, 1/8" thick The keychain loop is metal. Imported from Japan and manufactured by Morrison & Co., Ltd., PUNK magazine's licensing agents in Asia. The classic PUNK magazine "war emblem," created in 1978 to symbolize PUNK's war against bad imitations, is available in its classic four-color treatment. Made of sturdy rubber, 1/8" thick (the keychain loop is metal). 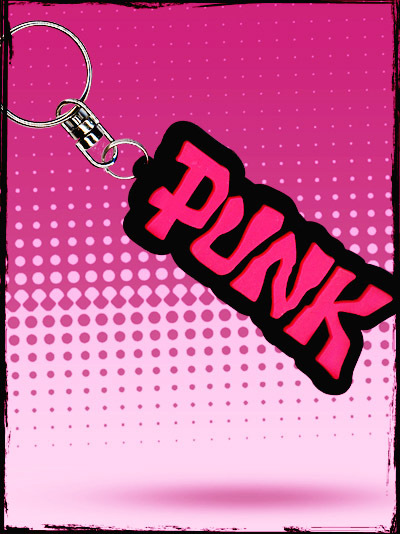 Imported from Japan and manufactured by Morrison & Co., Ltd., PUNK magazine's licensing agents in Asia. The first, original and greatest PUNK magazine t-shirt model! From PUNK #1, this skeleton has become a cult hero in Japan, where he's known as "Oscar Bones," who reportedly went to high school with PUNK editor John Holmstrom! Made of sturdy rubber, 1/8" thick (the keychain loop is metal). Imported from Japan and manufactured by Morrison & Co., Ltd., PUNK magazine's licensing agents in Asia. 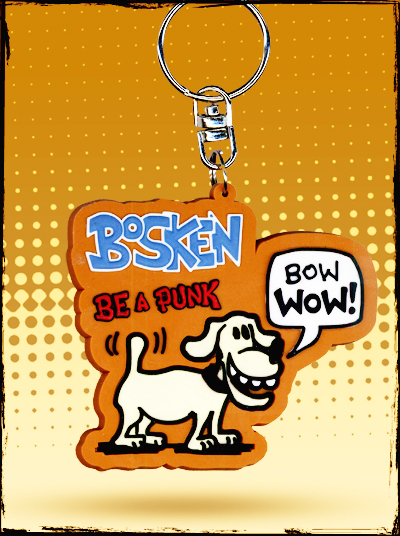 Bosken, Bosko's pet dog, appeared in the Rock City comic strips in the 1980s and then disappeared. But he's made a big comeback in Japan, where he's been featured on juice cans, clothing and more! This keychain is the first Bosken product made available in the United States, but won't be the last. Made of sturdy rubber, 1/8" thick (the keychain loop is metal). Imported from Japan and manufactured by Morrison & Co., Ltd., PUNK magazine's licensing agents in Asia. The greatest visual statement of all time! This Bosko keychain says it all. The original design from the classic centerfold poster from the Bosko #1 comic book! Made of sturdy rubber, 1/8" thick (the keychain loop is metal). 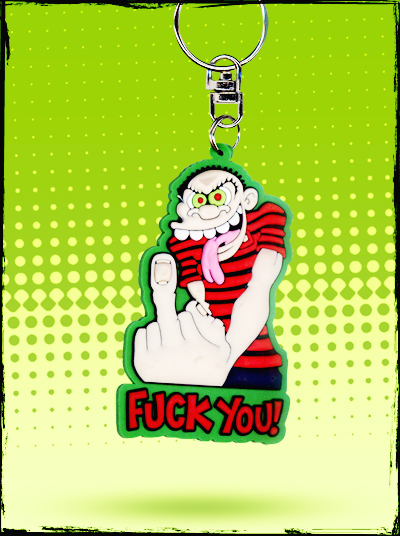 Bosko is molded, and appears as a 3-D character!Imported from Japan and manufactured by Morrison & Co., Ltd., PUNK magazine's licensing agents in Asia. A set of 7 KEYCHAINS! 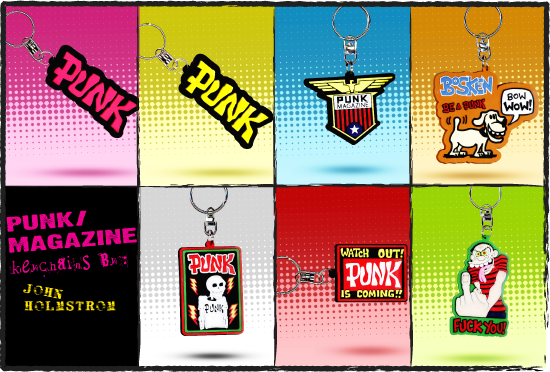 Get all 7 keychains (the yellow and pink PUNK logos, the PUNK emblem, the Watch Out!, the Skeleton, Bosko and Bosken) at a discount: Only 39.99!